Early safety flying helmet designed by Mr. Warren of Hendon. Manufactured exclusively by Tautz & Co. of Grafton Street, London with a double-skin shell of cork and thin steel plate separated with horsehair padding. The lower part of the helmet crown is surrounded with a wide padded band that extends to form a chin strap. 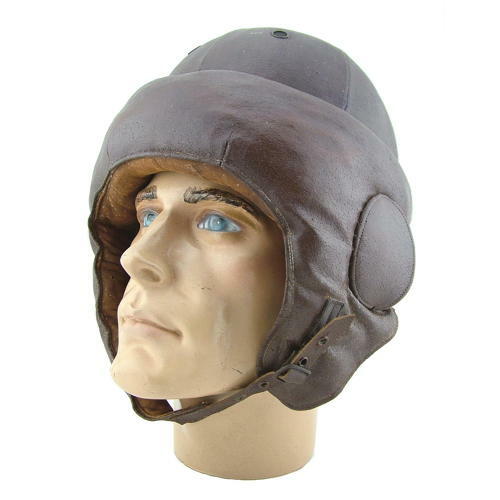 The outside of the helmet is covered in a proofed brown cloth with the appearance of leather. The crown is lined with leather and has an adjustable leather 'harness' whilst the lower padded section is lined with chamois. Fitted with 'earflaps' for use with 'Gosport' type communication tubes. This safety helmet had excellent shock absorbing qualities in case of accidents. Warren himself was keen to prove this and demonstrated by hurling himself headfirst at a wall and even letting others strike his head with hammers! Sealed as a pattern in August 1914 (Pattern No. 8115) the Warren helmet was popular with both RFC & RNAS trainees. Condition is generally very good. The overall shape is good and the leathercloth remains largely undamaged bar wear on exposed edges and parts of the chinstrap area. The leather lining and harness are also very good with lovely gold blocked manufacturer's details . The chamois is a bit soiled/rubbed and there are some holes exposing the horsehair padding beneath. The single pronged buckle has surface corrosion and there is wear/cracking of the supporting leather strap. The chinstrap itself is a replacement made to the same specifications as an original. Named inside to a 'J.M.S. Shepherd'. Overall this is a very good '+ example of an excedingly rare helmet. Fabulous! Stock code H22747.